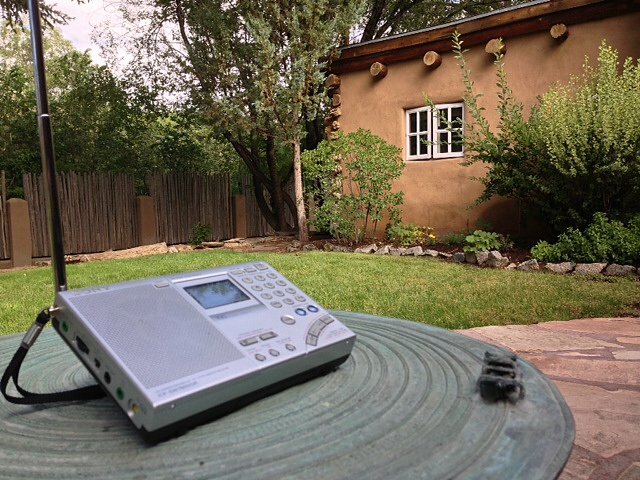 SWLing Post readers know that I’m a big fan of the, now discontinued, Sony ICF-SW7600GR shortwave portable. I try to post ‘7600GR deals when I find them and they’re beginning to become more scarce as retailer inventory depletes. This weekend, I found another deal via Blinq/Amazon. They have a number of new ICF-SW7600GRs for $138.39 and about 3 (at time of posting) listed as “Open Box” for $108.39. Click here to view on Blinq.com. I’ve bought a number of items via Blinq (directly and through Amazon) in the past and found that the retailer is not only reliable but has a very generous return policy if you’re not satisfied. You can buy from them directly or through Amazon with confidence. This entry was posted in Deals, News, Shortwave Radio and tagged Amazon, Blinq, Blinq.com, Deals, Sony ICF-SW7600GR on January 29, 2017 by Thomas. Regular SWLing Post readers know that I’m a big fan of the, now discontinued, Sony ICF-SW7600GR shortwave portable. Recently, I even wrote a post about finding some of the remaining units online. I’ve bought a number of items via Blinq (directly and through Amazon) in the past and found that the retailer is not only reliable but has a very generous return policy if you’re not satisfied. You can buy from them with confidence. Each time a ‘7600GR deal pops up, I’m very tempted to bite the bullet. I have two working units already though–“Coals to Newcastle” as they say! This entry was posted in Deals, News, Shortwave Radio and tagged Amazon, Blinq, Blinq.com, Deals, Sony ICF-SW7600GR on November 23, 2016 by Thomas. 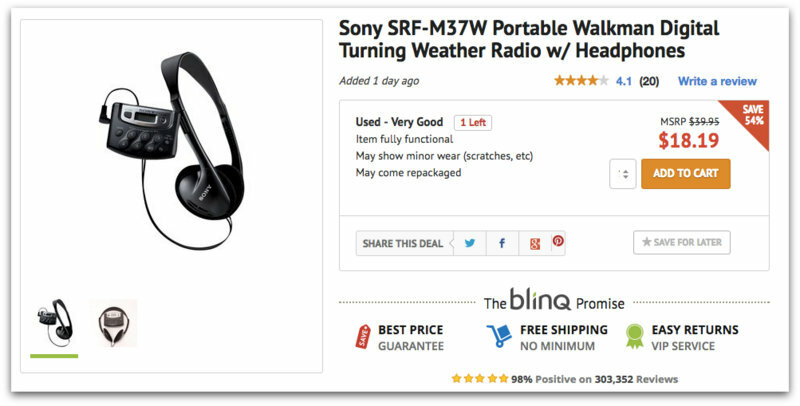 I just noticed that Blinq.com has a “Used – Very Good” Sony SRF-M37W AM/FM/WX digital walkman with headphones for $18.19 shipped. While I don’t think the SRF-M37W will win any DXing awards, it is a very practical and lightweight portable for outdoor/active use (hiking, walking, running, biking, etc). I was mighty tempted to purchase this one and mount it on my mountain bike, but I have other portables that could do the job. The SRF-M37W runs on one AAA battery. If you miss this deal on Blinq, no worries. Amazon’s price for a new unit is only $29.91 shipped–Amazon has a number of used units around $22 shipped. This entry was posted in AM, Deals, FM, News, Radios and tagged Blinq, Sony, Sony SRF-M37W, SRF-M37W on March 30, 2016 by Thomas. 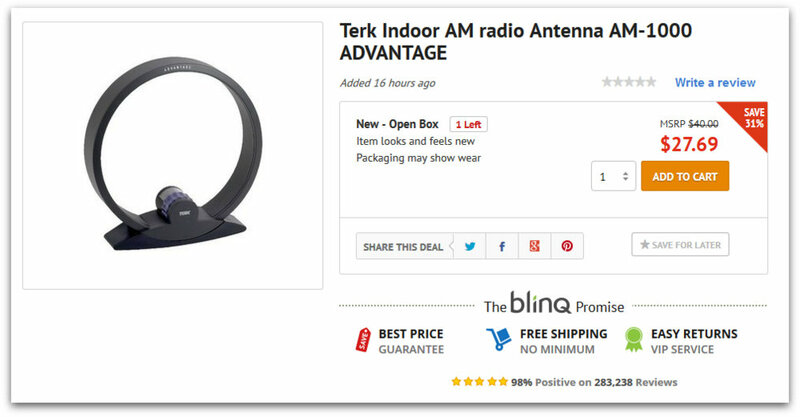 I just noticed that Blinq.com has a “New – Open Box” Terk AM-1000 Advantage indoor mediumwave loop antenna, on sale for $27.69. This is a great price for this quality AM loop which typically sells for about $50. The antenna (much like the Tecsun/Grundig AN-200) inductively couples to your AM radio. In other words, simply place your radio next to the antenna, tune to your desired frequency, then tune and turn the loop antenna until you maximize your received signal. Very simple to use. This entry was posted in AM, Antennas, Deals, News and tagged AM Passive Loop antenna, Blinq, Blinq.com, Terk AM-1000 Advantage on January 28, 2016 by Thomas. 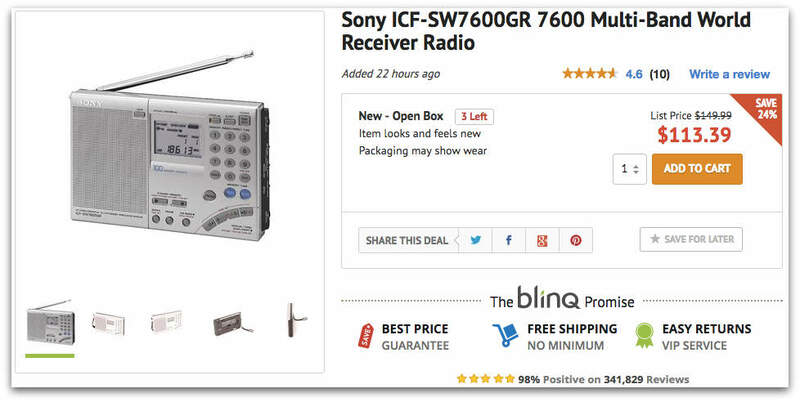 Blinq.com has another “used” Sony ICF-SW7600GR in inventory. As I mentioned once before when one of these surfaced on Blinq, this is a great deal for an excellent radio. This is a used unit, but if you receive it and are not pleased, you can return it to Blinq free of charge. If you’ve never visited Blinq.com, or if you open their website in a private/incognito window, Blinq will typically pop up a window offering 10% off for new shoppers as long as you subscribe to their newsletter. You then receive a coupon code via email you can use with the first order. Click here to view the used Sony ICF-SW7600GR on Blinq.com. This entry was posted in Deals, News, Shortwave Radio and tagged Blinq, Sony ICF-SW7600GR on January 22, 2016 by Thomas.